We’ve all been there, racking our brain trying to figure out the perfect gift for our loved ones. Verizon has teamed up with Spotify to bring us a fun and innovative way to tell our friends and family what’s on our wishlist this holiday season. 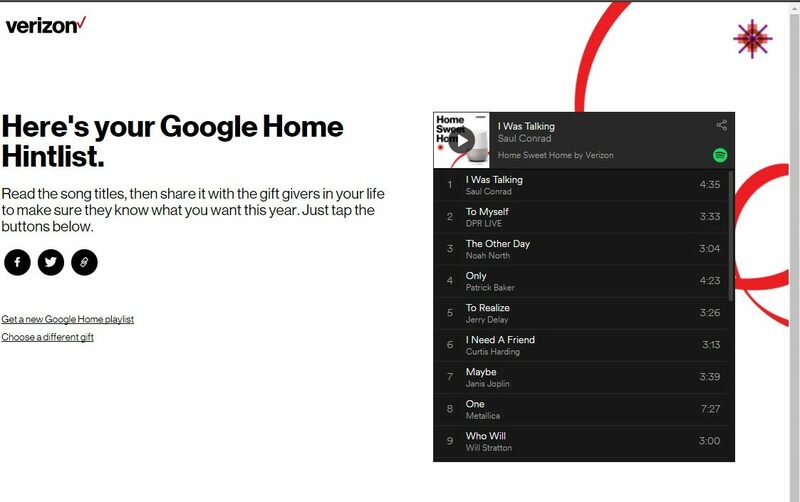 Verizon and Spotify launched Verizon Holiday Hint List (<— Click there to try it for yourself) where you can enter your name and your desired Christmas gift. The hint list will generate a music playlist that will give the hint of your gift without completely spilling the beans. I tried it for myself and my hint list is spot on! I clearly wanted the Google Home device. Look below!